Everyone has the experience of “Outlook not sending emails”. In this article, we’ll guide you through the top reasons responsible for Outlook not sending emails and how to fix them. Check if your mail server is online or offline? You can look at the bottom inside Outlook. 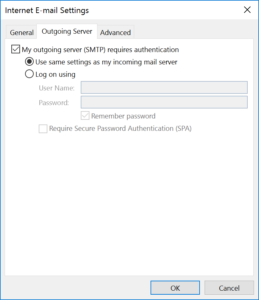 Check if you enable My outgoing server (SMTP) requires authentication? Nowadays, every mail server requires authentication and there is no exception. Check if you attached a very big file in the email as attachment? If you did, then try remove this big chunk of attachment and try to send it again with attachment less than 20MB. Check the spelling of recipient’s email address, especially the username part and domain name part. Check attachment’s file extension. Please keep in mind that .exe and .zip are not welcome now. They are usually denied by recipient’s mail server. Check the DSN (Delivery Status Notification) error message. Sometimes, you get a quota exceed bounce back message, which means the recipient’s mail box is full., and you have to find other way to contact him since email will probably will not work. This means you are sending an attachment file which is not allowed by the SMTP (Gmail’s). You are probably sending to or via a Gmail account. To solve this, do not send files with .exe extension for example. If you insist to do so, you can rename the file to *.bin and it will pass. Technical details of permanent failure: Google tried to deliver your message, but it was rejected by the server for the recipient domain ***.com by *.*.*.*. This means there is no such recipient account on destination mail server (the one you try to send to). This could be caused by a typo of username part of the recipient email or this user account may not even exist. When this happens, you really cannot do anything about it. Most commonly mistakes committed by senders and they usually deny it. Mails will not be delivered in real-time until a second attempt. Recipient’s mail server takes the blame. EX. 1 – 451 4.7.1 Temporarily rejected. Try again later. EX. 2 – 451 Resources temporarily unavailable. Please try again later. EX. 3 – 450 4.7.1 **** : Recipient address rejected: Policy Rejection-Please try later. It is a bit shameful to tell the truth but your mail server sends out too many spam mails and recipient’s mail server has temporarily or permanently deny any mail from your server. EX. 3 – 421 #4.4.5 Too many connections to this host. Technically, this is a DNS issue that commonly happens in IDC or educational institutes where your IP fail to be reversely resolved into your mail server’s hostname. However, most ISP does provide a default value for the reverse IP resolution. Make sure your mail server have one. EX. 1 – 421 Refused. You have no reverse DNS entry. Com’on! Please gently acknowledge users that they key their own email address wrong. Please advise them to correct it within their email software. Apparently, this is no one’s fault. Please advise your users to inform their recipients by other means such as phone call, text message or social network software. This situation is often caused by your mail server’s IP, your mail server’s reverse IP resolution value or geological location to which recipient’s mail server just denies it for no reason. Some recipient mail servers just refuse to accept emails containing files with certain extensions such as .EXE or .ZIP. Next postHow to record Skype video and calls?